Many different people are drawn to the nursing field. 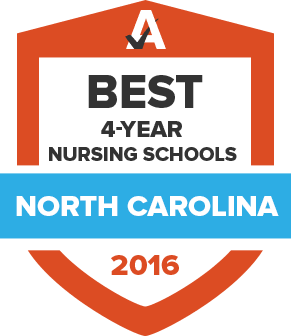 Whether attracted to the lucrative salaries, the reward of helping others, or the challenge of working in a dynamic healthcare setting, nursing schools in North Carolina can help aspiring RNs achieve their career goals. Find out more about where you can get proper education and training, as well as what is required to become licensed in North Carolina. With a projected shortfall in qualified nurses, nursing schools in North Carolina are stepping up to provide additional programs and more flexible opportunities for students. Entry-level, pre-licensure programs fall under the jurisdiction of the North Carolina Board of Nursing (NCBON) and are offered as both two-year and four-year programs. Registered nurses may earn an associate degree or a bachelor of science in nursing to meet the requirements for state licensure. The search tool below can help you narrow your school choices to those that meet your personal and professional needs. Nurses must undergo rigorous training and hold a valid license in order to practice in North Carolina. And those who want to treat patients in a specialized area as a nurse practitioner or other advanced practice nurse must fulfill additional requirements. The North Carolina Board of Nursing oversees the licensure process an effort to standardize care at the highest level across the state. Applicants whose state of residence is a Compact State other than North Carolina should apply for licensure in their home state. That license is good in all Compact States. If your home state is not a Compact State, apply for a single-state license in North Carolina. Provide proof of completion of an approved education program. Graduates of an out-of-state school will need to have their institution submit official transcripts directly to the NCBON. International graduates are required to complete a Credentials Evaluation Service (CES Professional Report) or submit a CGFNS Certificate or VisaScreen. In most cases, international applicants will also need to pass an English proficiency exam. All nurses must meet one of the above requirements and submit a $100 fee to renew their licenses. The North Carolina Board of Nursing website has more information about advanced practice licensing and renewal. A number of podcasts are available for continuing education and personal development through the Board of Nursing. The North Carolina Association of Occupational Health Nurses is a group of about 300 occupational nurses in the state that works with the American Association of Occupational Health Nurses to advance the field. The North Carolina Board of Nursing regulates the practice of nursing and is the government agency that issues licenses and approves educational facilities. North Carolina Nurses Association is the professional organization for nurses in the state and advocates for nurses and their patients. North Carolina Organization for Nurse Leaders helps promote nursing leadership and boost public policy to strengthen the field. It partners with several other organizations in the state to also help improve patient care. The School Nurses Association of North Carolina was established in 1992 to provide networking opportunities, professional resources and advocacy for school nurses in the state.